NEW YORK CITY, February 17, 2016 – The Campagnolo GFNY Championship in New York on May 15 will be sanctioned by USA Cycling. A rule change in the competitive mass participation category opened the door for a renewed partnership. For its inaugural edition in 2011, GFNY was sanctioned by the UCI and USA Cycling. However from 2012 to 2015, USAC rules prevented GFNY from being accredited as such. The rules initially did not allow competition prizes and were later modified to award prizes based only on timed climbs. GFNY participants are chip timed start to finish and GFNY awards prizes based on total time from the start to the finish line of the 100-mile race. “Gran Fondo” stems from Italy with the first event being held in 1970. The Italian Cycling Federation (Federciclismo) defines a “Gran Fondo” as a mass participation cycling event with results and awards based on start to finish timing. 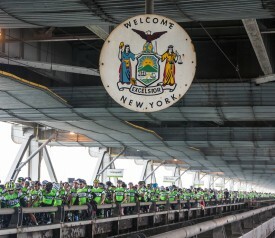 GFNY is modeled after Italian Gran Fondos.